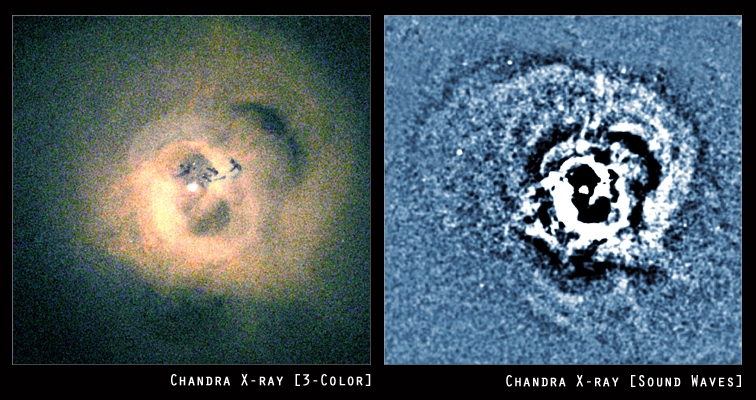 A 53-hour Chandra observation of the central region of the Perseus galaxy cluster (left) has revealed wavelike features (right) that appear to be sound waves. 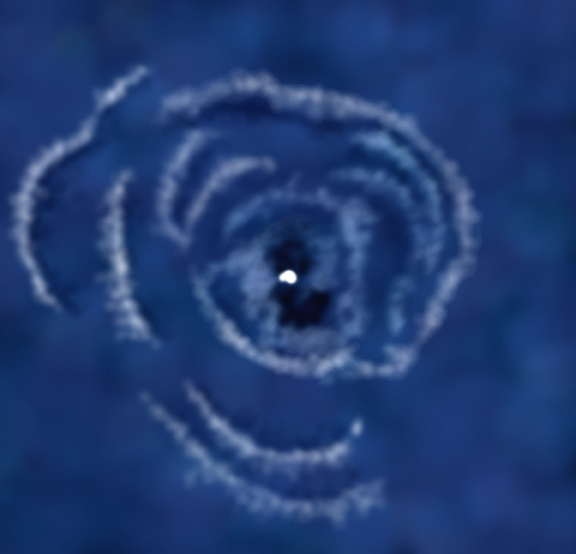 The features were discovered by using a special image-processing technique to bring out subtle changes in brightness. These sound waves are thought to have been produced by explosive events occurring around a supermassive black hole (bright white spot) in Perseus A, the huge galaxy at the center of the cluster. The pitch of the sound waves translates into the note of B flat, 57 octaves below middle-C. This frequency is over a million billion times deeper than the limits of human hearing, so the sound is much too deep to be heard. The image also shows two vast, bubble-shaped cavities, each about 50 thousand light years wide, extending away from the central supermassive black hole. These cavities, which are bright sources of radio waves, are not really empty, but filled with high-energy particles and magnetic fields. They push the hot X-ray emitting gas aside, creating sound waves that sweep across hundreds of thousands of light years. The detection of intergalactic sound waves may solve the long-standing mystery of why the hot gas in the central regions of the Perseus cluster has not cooled over the past ten billion years to form trillions of stars. As sounds waves move through gas, they are eventually absorbed and their energy is converted to heat. In this way, the sound waves from the supermassive black hole in Perseus A could keep the cluster gas hot. The explosive activity occurring around the supermassive black hole is probably caused by large amounts of gas falling into it, perhaps from smaller galaxies that are being cannibalized by Perseus A. The dark blobs in the central region of the Chandra image may be fragments of such a doomed galaxy. Scale Left panel is 284 arcsec on a side; right panel is 400 arcsec on a side. Coordinates (J2000) RA 03h 19m 47.60s | Dec +41° 30' 37.00"
References A. Fabian et al. "A Deep Chandra observation of the Perseus cluster: shocks and ripples." 2003, Mon. Not. R. Astron. Soc. (in press); also astro-ph/0306036v2.